What better way to increase your booth traffic. Stop potential customers so your sales staff can talk to them about your product or service. Leave them with a shining impression of your company. 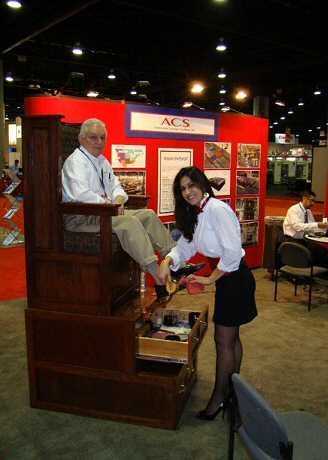 We also provide booth models. 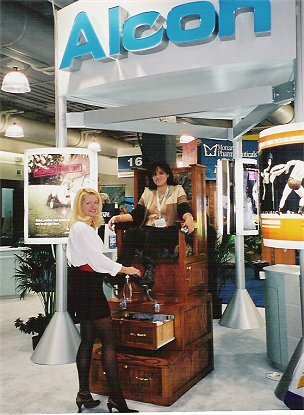 Since 1984 THE CLASSIC SHOE SHINE CO. has built a quality reputation in providing one of the most unique and effective Trade Show and Convention services to boost your sales and profits. THE CLASSIC SHOE SHINE is an exclusive 23 step process, including a soothing foot massage, and quality leather products applied by our attractive and well trained models. Our attractive models are dressed in our Classic Tuxedo Uniform or you may choose a theme outfit for your trade show or convention. Click to view our scrapbook of recent trade shows and conventions.